Talking about her daddy teaching her how to use a shotgun, Miranda Lambert threatened Chris Brown’s life during a performance Thursday night. Miranda is married to ‘The Voice’s Blake Shelton and she has been vocal about her anger and disgust towards Chris because he beat up Rihanna. I think you will see that Miranda goes way overboard here and her remarks appear racist. 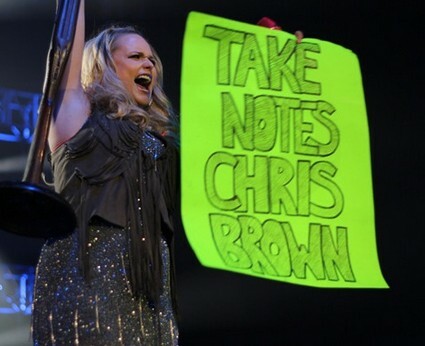 Lambert held up a sign reading “Take Notes Chris Brown” and then sang a song that talks about a beaten and abused woman preparing to kill her husband – “Gunpowder and Lead.” I’d call that a threat and an incitement to violence. Miranda also lashed out at Chris on Twitter complaining that he was allowed to perform at the Gammys even though he has a history of violence towards women. Whatever you might think of Chris Brown we don’t approve of calls for vigilante violence. We have rule of law here in America and we don’t need redneck Miranda acting as if she is trying to incite a lynch mob. Why is this nutjob picking on Chris – why not go after other celebs who have beaten up women and been arrested for domestic violence – such as Mel Gibson, Nicholas Cage, or Charlie Sheen. Is there a pattern here? What does she mean by Chris being ‘put back in his place.’ Is this woman a blatant racist? County Stars Blake Shelton & Miranda Lambert Got Married!